First of all, I'm beginning to consider the idea that having a cell phone is a major pain. The reason being that just about the time your getting, into a good conversation or doing business, somebody needs to disrupt your meeting for something trvial. Okay that said, when I'm 100 miles away from the Wolf's Lair, I really can't do anything about your presumed crisis. Ah the days of just a simple two way radio and a landline. Now then; Yesterday had a great day. Went down to Utah, got a tooth pulled, by a dentist that in Utah accepts Medicaid from Wyoming. Funny; Wyoming don't accept Medicaid anything from another state. Go figure. So then went to Sills Cafe in Layton, met up with re-elected Club President Jonny, who had to unfold to our awaiting new talent all the old exploits of mine as a youth. Mostly dealing, with my experiences with ladies. With that, Jonny is showing his age. He's much heavier, guess that rolls in with age, he doesn't look as spry, and wirey as he used to. Used to be Jonny was as skinny as a rail, and you could feed him enough. Mid point , Alesha shows up, and with the traditional pleasentries got into business. By now she's feeling a bit shy here, this is not moving as fast as it could. But there was a curve ball thrown that has me having to rearrange priorities. Our illustrious property owner of the shop, has decided to begin developement of the grounds to a planned housing project. So shop looks like its going to get hashed. However I could save it, if it were not for the condition that the owners of the property I live at or where the Wolf's Lair is, raised the rent by nearly, $50.00 a month meaning I now have to rake up each month an additional $100.00 a month just for my domicile. Can't afford that and shop at the same time, so need to devote more time to radio station project. That means looking at relocation to at least Utah somewhere metro, for the human and support resources needed to do that where it'll pay. Not just consume. Something has to give, so throwing off the shop, moving much of my rides to Rick's and just hauling to Utah for a time until residence can be found there. Have Alesha looking for housing, shop, studio. Now on my domicile. Yesterday started out lousy. I went to bath & shower, only to find the handle to turn on the water didn't work well if at all. So the mechanic that I am, took the damn thing apart, only to find the handle made of plastic, why not good old American steel is my question, must be build cheap, charge more. So with a 5/16th end wrench, I got my bath & shower. Oh and even with the eventual repair, the newer fixture is on upside down and still doesn't function well. Oh I'll pay most if not all my rent with some help from my Bishop and all, but it's just one more thing that says, this isn't the place, at least for me. Then woke up with thoughts of going out for milk and snag a bite to eat, except I realized that , hey I'm still in Evanston, Wyoming, not metro Utah, where 24 hour food stores other than Walmart, since I have no longer any loyalty to. After last week on the battery situation and the udderly idiotic nature of even the assistant manager of our local Walmart here couldn't even refund the core charge on a battery. 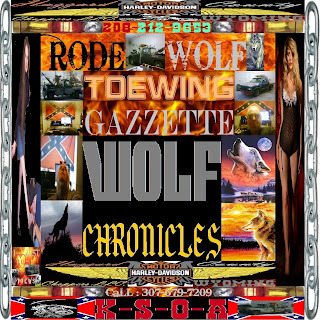 So after I realized, no food run at 02:00 was possible, did some editing on some audio for tonites HazzardAyre/RodeWolf radio show, been hit and missing on a few TV shows. So in summary, Its go radio, do a few toews, find new shop, get photo projects done with Alesha, relocate to metro Utah, hold off on Idaho for a few months if not a year, and go from there. Jonny is looking older , but it was good to visit with him, and get some Club business done.